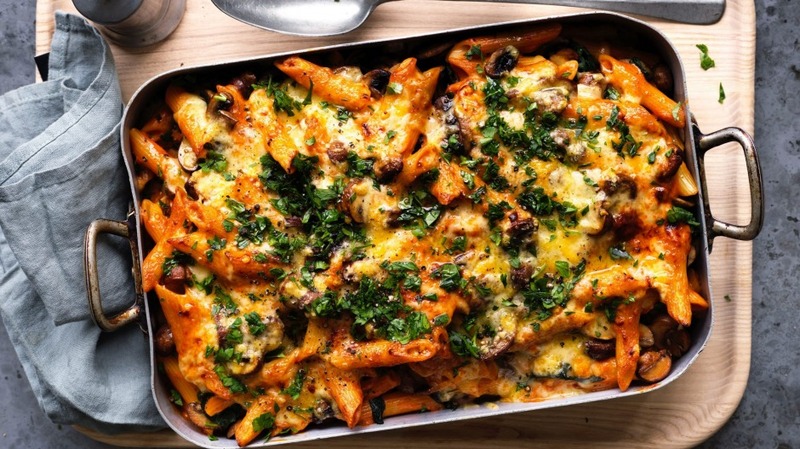 A pasta bake doesn't need a lot of time in the oven. Rather, grill it just long enough to melt the cheese on top. Bring a large saucepan of salted water to the boil. Cook the pasta according to packet instructions until al dente. Drain, rinse with cold water and transfer to a 2½-litre baking dish. Rinse the saucepan and return to medium-high heat. Add the half the butter and the onion, garlic and thyme and cook until golden, about 5 minutes, stirring regularly. Increase the heat to high, add half of the mixed mushrooms and cook for a further 5 minutes, stirring occasionally, until the mushrooms are browned and softened. Transfer the contents of the pan to a bowl. Add the oil to the pan, then stir in the spinach for a minute until it is wilted. Remove spinach from the pan and set aside, allowing any moisture released to drain away. Add the remaining mushrooms to the pan and cook until browned, about 5 minutes. Return the first batch of mushrooms to the pan and mix well. Reduce heat to medium, add the tomato paste and paprika and cook for 1 minute, then add the flour and cook for 2 minutes, stirring constantly. Gradually stir in the stock over medium heat until a thick sauce is formed (this takes about 5 minutes). Stir in the sour cream and wilted spinach and turn off the heat. Preheat your grill to high. Stir one-third of the sauce through the pasta to combine, then pour over the remaining sauce to cover. Scatter very lightly with cheese and grill until the cheese is golden, about 5 minutes. Scatter with chopped parsley and serve with some green salad leaves on the side. Adam's tip: When cooking pasta for pasta bakes, you don't need to seriously undercook it – al dente is fine. It will soften further by absorbing moisture from your sauce.